Florida schools: Now allowing prayer under the guise of "inspirational messages." Gov. 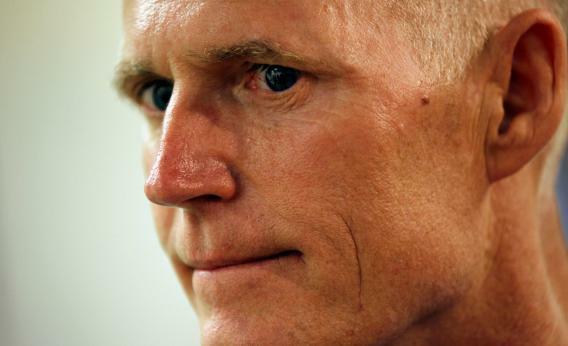 Rick Scott speaks during a bill signing ceremony on June 12, 2012 in Miami, Fla. The 2010 Republican electoral sweep promised a shiny new return of the entire range of right-wing grudges that never seem to go away, no matter how silly and archaic. Among the most pointless is the long-standing conservative temper tantrum over the 1962 decision Engel v. Vitale, in which the Supreme Court found that schools can’t promote religion, due to First Amendment protections. Since you can pray before, during and after school—24/7, if you like—so long as you don’t try to push your faith on others using school events as an excuse, there’s simply no logical argument for the now 50-year-long fit the right has thrown over this. But instead of just giving up, politicians continue to waste their and everyone else’s time trying to find innovative ways to get around the “don’t push your religion on other people with the direct or implied endorsement of the school” rule. Florida is just the latest state where God-bothering politicians think they’ve found a way to use school authority to bully the irreligious, the non-Christian, and those who prefer to follow the New Testament’s injunction to pray by entering “into thy closet, and when thou hast shut thy door, pray to thy Father which is in secret.” The state implemented a new law this month that allows students to lead, er, not prayer—the courts say no!—but “inspirational messages” at noncompulsory school events like school trips, games, and graduation. It’s basically a cover to let the irritating Christian kids guilt-trip everyone into praying left and right, a way to get around the spirit of the law while adhering, maybe, to the letter. The defenders of this bill, and countless previous attempts like it, always try to pretend that kids are being prevented from practicing their faith on school grounds, but that has pretty much always been a lie. No one cares if a kid prays to himself before a meal or a particularly scary math test. The problem is when school events make public displays of religion, pressuring others to join in. This law, while prohibiting teachers from doing what some of mine unfortunately did (making us gather together before events to pray to their God, in violation of our First Amendment rights), allows students to do the same thing. Florida has basically come up with a way for the members of the community’s dominant faith to use school functions to send the message of their one true faith. The rest of us are either forced to stand out by not praying or go against our beliefs by playing along. Putting the implicit school authority behind these “inspirational messages” is clearly a violation of First Amendment rights, even if the appearance is of a kid “spontaneously” leading the entire community in a Christian prayer at graduation. My one hope is that an atheist kid decides to test this law by offering an inspirational message during a graduation speech about how there is no God and once you die, your consciousness blips out of existence and that you ever existed will eventually be forgotten by humanity. Hey, I find that message inspirational. The same sort of people who support these kinds of laws tend to flip out when someone offers minority opinions on faith like that in public, and it would create interesting grounds for a lawsuit.